Inspired by the organization’s work, we chatted with KK intl.’s CEO and Cofounder Kohl Crecelius about the creative challenges of running a non-profit apparel company that challenges traditional models of, well, everything. What is Krochet Kids intl., and how is it different than most clothing companies? Other than the fact that we make and sell apparel and accessories, we are different in about every way possible. We exist to empower people to rise above poverty, and this process starts with who we employ. We have a local staff working in Uganda and Peru within very poverty-stricken communities who identify those that are most in need and who could benefit from involvement in our programs. 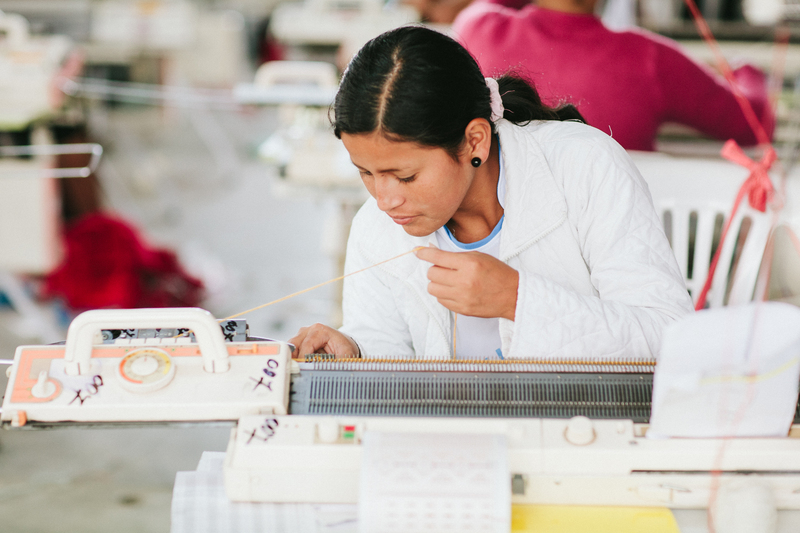 Once they start participating, the women who produce our clothing are not only provided with a fair and consistent income but also receive education and mentorship. All in all, we are very proud of how are items are made and so are the women who make them. Each product is hand-signed by the person who made it, bringing greater transparency to an industry that historically has sought to hide how their products are made. How is it different than most non-profits? On the non-profit side, we are reimagining the traditional funding models that philanthropic endeavors have relied on for years. Since we do create great products and sell those, we are a lot less dependent upon charitable donations for our existence and growth. This has been a big point of differentiation, and we are proud that over the last few years we have generated over 85% of our revenue through product sales. Krochet Kids intl. helps women in Peru and Uganda empower themselves through employment. What are some of the biggest creative challenges that you’re up against as a clothing brand that’s also a non-profit? There are a number of challenges, but we gladly assume them in pursuit of our real mission: empowerment. Some of the challenges have to do with efficiencies from a product-building standpoint. We work with those who are most vulnerable, which often means they have no formal training and little education. Needless to say, we could probably produce more, faster if we solely worked with skilled laborers. Alternatively, we also face a communication challenge. 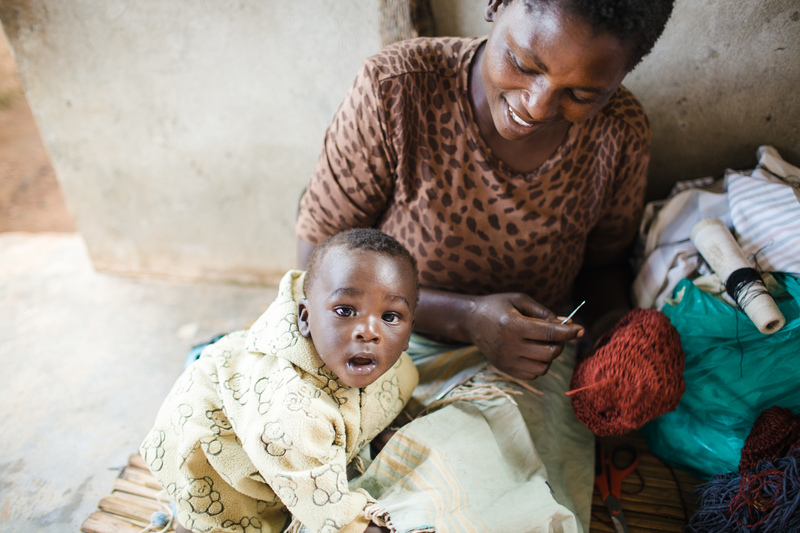 We do so much work on the ground to provide long-lasting impact for the women we work with. We have to delicately balance being a relevant clothing company, as well as a reputable non-profit organization. At times, those are two very different audiences. As a creative leader, what are you obsessed with? Culture? Design? Marketing? Relationships. Everything comes down to people: staff, vendors, partnerships, donors, you name it. At KK intl. we have always placed a huge emphasis on creating meaningful relationships. The best opportunities for our brand have come through friendships and creating win-win partnerships.Everyone I come in contact with is first a friend, then a potential ally to support the work we do. I hope those we worked with at Column Five would agree. Where are you finding your inspiration? Where does the brand draw inspiration? How much of an overlap is there? I try to have a steady and balanced diet of inspiration. (I’ve never thought of it this way, but it’s true.) I love reading, watching biopic Netflix documentaries, traveling, and being around really great people pursuing their dreams. I also love the internet and social media for staying connected and in the know. Much of those influences are sought out by our staff. Each Krochet Kids intl. item is handmade, helping consumers form a deeper connection with the person behind the product. From working with you on your annual report, we’ve found that you’re hands-on in creative and marketing, which is not always the case with CEOs. What do you think the advantages and potential disadvantages to this are? You ask good questions. I am very passionate about communication and I love idea generation, so I have always been very involved with our marketing throughout the history of KK intl. We have been fortunate to be able to start to grow our staff, and there is more support on the marketing front to help me not have to be involved in every aspect. But when it comes to big projects like the annual report, I want to be present to help communicate all the intricacies of our brand and messaging. It helps with consistency of voice and authenticity, which are major brand traits. I am, however, aware that there are really only so many hours in a day. What role does storytelling play in your marketing and in your fundraising? It is everything: the story of how we got started, the story of how our products are made, the story of a woman whose life will never be the same. People attach themselves to, and identify with, stories they don’t identify with brands. You guys are doing some really interesting things with data mining, analysis, and visualization; how important is this information to you guys, and how is it impacting your decision making? When we started our work within developing countries, we wanted to do a lot of things differently from what we had seen with international organizations. We didn’t want to merely say we had impact; we wanted to PROVE IT. Fortunately for us, one of our close friends was a cultural anthropology student and has lead our monitoring and evaluation efforts since the earliest days of our work. Monthly, we collect data on 45 different indicators for each participant in our program in Uganda and Peru. This data serves two main purposes. 1) It ensures that we are actually creating long-lasting impact. 2) It allows us to provide contextualized help and services to individual women. Our programs don’t fight poverty from a 30,000-foot view. We are closely monitoring and reacting to individuals to create a unique plan for their empowerment. What have you learned about donation decisions, and how have you shaped your business/communications to cater to them? A lot of us have similar goals when we are donating our hard-earned money. We want to know where it is going and we want to ensure it is creating the most impact possible. For us, we are able to leverage our unique income-generating model to give donors confidence in their impact. We are able to generate over 85% of our operating revenue annually, and with this we cover the overhead and fundraising expenses we incur. This results in allowing us to direct 100% of public donations to our initiatives on the ground, and we are finding donors are excited about this. It speaks to our long-term sustainability and our impact. What would you tell people who might be interested in doing good in this world but don’t know where to start? I would first say to take inventory of what you are already good at and what you love to do. Too often people try to help in ways that are out of their immediate knowledge and skillset. As a result, they either burn out or are not effective. We knew how to crochet, and we came across a community that desired to learn a skill and begin to work. We paired the two. At its core, it was very simple. I would encourage others to think of simple ways to start helping, then build from there. What about people who want to start their own non-profit? Any words of wisdom and/or caution? Anything is possible. (I really believe that.) One of the most important things is to get a community of peers, as well as a community of mentors/advisors involved in your vision and move forward together. If people aren’t excited enough about your work to get involved at those earliest stages, you might want to rethink your strategy or mission. I wish we would have had more mentors, more engages, sooner. We are excited to continue to share more about the story of our data, which our annual report does a great job with. Through this we can continue to connect our customers with the beneficiaries who make our products in more significant ways. Ultimately, we are challenging multiple industries with our model, and we are excited to shake things up. Apparel manufacturing has been in need of a serious overall, and I would say the same goes for non-profit organizations. We’re providing new models for how they can happen. What’s the best way for people to get involved with what you guys are working on? Check out our online store. Purchase something you like. And visit the profile on our website to learn more about the lady who made your product. If you’ve already done that and purchased items for your friends, consider donating.